ATMEL, represented by Braemac , has announced the release of its 128Mb AT45DB1282 DataFlash device. The 2.7V sequential access AT45DB1282 features two interfaces: an SPI compatible 40MHz RapidS serial interface with a read throughput of 5MB/s, and a 20MHz Rapid8 8-bit synchronous interface with a read throughput of 20MB/s with no page-to-page latencies. The AT45DB1282 represents a major step in Flash memory innovation offering the design engineer significantly more flexibility and performance. 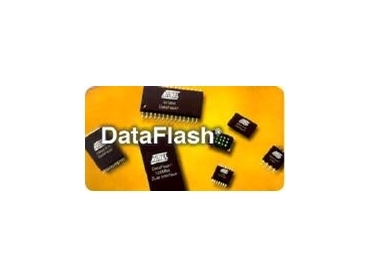 This 128Mb device is the world's fastest serial interface flash memory, the simple 4-pin serial interface greatly simplifies system design, reduces pin-count, power consumption and switching noise. System designers can use either interface, or both, to best support their end system requirements. This device has been designed to enable advanced features and functionality in a variety of high volume products and reduce total system cost. The device is the first in a series of high-density, high-performance and low cost DataFlash memories manufactured using Atmel's e-STACTM Multi-Level Cell (MLC) memory technology, which allows a single cell to store two bits of information. The combination of the DataFlash architecture, very small page size (1,056 bytes for both program and erase), on board SRAM buffers which allow for self-contained rewriting to the Flash memory array, low pin count interfaces and the e-STAC memory technology, allows for a flexible and low cost system solution. The low pin-count RapidS and Rapid8 interfaces can easily connect to the system processor or controller directly or with a single command burst information from the DataFlash into a "shadow" SDRAM or SRAM usually present in the target applications, at power-up, and execute programs from there. The benefits of code shadowing from DataFlash are many, beginning with a very low pincount interface, low read currents of 10 to 12mA typical and the code image can be stored in a compressed state to reduce the total flash requirement. Using the Continuous Array Read command the entire device (132Mb) can be read out in less than 0.9 seconds. This latest member of Atmel's DataFlash family includes new features to ease system design. A 128-byte security register has been added for end product security uses. This register has a 64-byte user programmable space and a unique 64-byte device indentifier. The AT45DB1282 also supports the Atmel sponsored and recently approved JEDEC standard on manufacturer and device identification for serial Flash memories. The DataFlash family of devices range from 1Mb to 128Mb and deliver reliable solutions to store both embedded program code and data in a low pin-count small footprint package, for the lowest total system cost.